Here at TumbleRoot, we strive to make the highest quality products for our customers! Not only are most of our products made in the USA, but they’re made with eco-friendly materials, and made in safe work conditions by people who are given fair wages. We always make sure the vendors we work with have the same values as us. TumbleRoot also has a Tanks for Tails program where we donate a percentage of the profits made from tank tops to our local animal shelter. 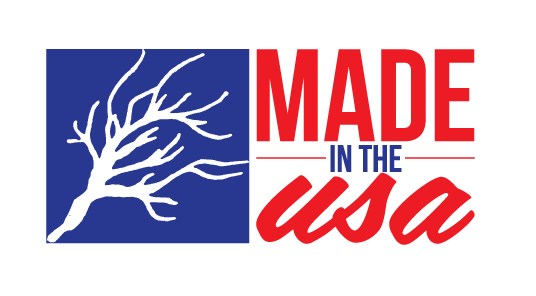 You will find this Made in the USA logo on all of our products that are made in the USA! If a product does not have this logo, we make sure that it is made in a country where the employees are treated and paid fairly. Alternative Apparel, Bella, and American Apparel are a few of the vendors TumbleRoot works with. We choose to work with these companies because they are very mindful of their social responsibilities. Click on their logo to learn more about the specific ways they choose to be socially responsible. TumbleRoot donates a percentage of the profits made from the Tanks for Tails to Woods Humane Society, which is our local animal shelter. We believe pets are part of the the family and we love donating to help such a great cause! Our Luke Bryan inspired “Crash My Party” tanks in black and mint! Kacey Musgraves inspired “Follow Your Arrow” tanks and shirt! Miranda Lambert inspired “Famous in a Small Town” tanks! We love hearing what you all have to say! Follow us on Instagram, Pinterest, Tumblr, and Twitter and let us know what you’d like to see in our next design! It all started with a dare. My business, that is. What is now TumbleRoot began when my friend dared me to hop on this crafty little site called Etsy and start selling my artwork. I knew it would go nowhere, so I listed a few things and thought nothing of it. But I was hooked. Despite already having a 40-hour-a-week job, I poured every bit of my formerly-known-as free time into it, staying up to ungodly hours to pack, stamp, and mail my work, and then to design new things. And still I couldn’t keep up. I hired my first employee, just in time for an unexpected wallop: the holiday rush. Together, we slogged through, tired, ragged, barely sleeping, fingers inked and gooey as my designs became holiday gifts for people I’ve never met—and I realized that I’d never been happier. Today’s TumbleRoot, barely a year old, is a way to channel everything we love—namely beer, country music, and designing cool stuff—into a cohesive brand. I say “we” because I roped my then-fiancé (now husband) into this crazy entrepreneurial endeavor. His pragmatic skepticism complements my passionate optimism. We provide apparel, art, and accessories for the concert-goer, the partier, even the birthday beer crawler. The name TumbleRoot is inspired by the tumbleweed, which is sort of the overlooked desert explorer of the plant kingdom. The tumbleweed just isn’t good at standing still: it always rolls on, looking for new adventures and places to spread its seeds. That’s exactly how we felt about starting this company. It’s our chance to leave our fears behind, and spread a little country flair while we do it. But unlike the tumbleweed, no matter how far we roam, our roots (and our hearts) always remain at home. Since we started in September 2012, we’ve gotten married, bought a house, and adopted two adorable furry children dogs, and the business has grown from one employee to five. Our small house has quickly been overtaken by inventory and workstations, and we’ve artfully crammed every nook and cranny with more awesome stuff that’s waiting to be sold. Our date nights and relaxing evenings have turned into team meetings and design marathons. Time with friends used to mean wine tasting and beer drinking; now it means wine tasting and beer drinking…while enlisting their help to plan photo shoots, build websites, run financial reports, write payroll checks, and scrutinize profit margins. Oh, and the friend who dared me into the best thing I’ve ever done? She models our clothes on our website. Be sure to share the voting link with all of your friends!